A top commander in the Texas Department of Public Safety forged a signature and tampered with government records in an attempt to fire a whistleblower, according to a federal lawsuit that I filed this morning, and the commander probably didn’t act alone. Meanwhile, an East Texas DA has referred the case to the Texas Attorney General for further investigation and possible prosecution. You may recall that Trooper Billy Spears made international headlines in 2015 after he was reprimanded for allowing himself to be photographed with Calvin Broaddus, a.k.a. the Doggfather of rap, a.k.a. Snoop Dogg. 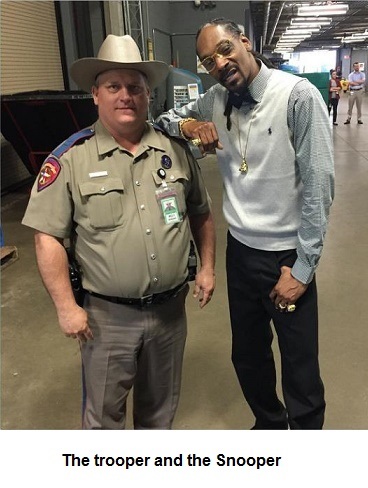 You may also recall that we obtained an email from DPS Director Steven McCraw complaining that Billy allowed himself to be photographed with a “dope smoking cop hater.” DPS brass took a beating in the press, and shortly thereafter we filed suit against Billy’s superiors for retaliating against him (both before and after the Snoop Dogg photo). In 2016, someone in Billy’s chain of command post-dated a memo and cut-and-pasted Billy’s signature onto it in order to deny him a medical waiver for an on-duty knee injury. Billy submitted the original memo in late May of 2016, but the date was changed to June 2, 2016 to make it appear untimely (and the altered memo included facts that had not occurred as of the time that the real memo was written). Billy’s supervisors then denied the waiver request without bothering to tell him, so Billy did not know they were still expecting him to pass a physical fitness test despite the knee injury (which subsequently required surgery). Out of the blue on September 1, 2017, Billy’s superiors informed him that he had been placed on a “performance improvement program” and he was on the verge of being fired because he had not passed his physical fitness test. You may be wondering how we can prove that Billy’s signature was forged. For starters, DPS cannot produce the original. More significantly, Billy was out of the office from May 26, 2016 until December 17, 2016, so he could not have come into the office to sign the memo on June 2, 2016. Billy’s captain had banned him from the office after he went on medical leave. Even though Billy had a signed waiver form from his doctor, and even though waivers signed by doctors are normally granted pro forma, Major Michael Bradberry of Garland advised Billy’s captain to deny the waiver. The major was a defendant in Billy’s first lawsuit, and now he’s a defendant in the second lawsuit. He is also the prime suspect for the forgeries. On Billy’s medical waiver form, the handwritten date next to the signature of Billy’s captain has been altered from June 5, 2016 to June 3, 2016, and the “3” clearly is not in the captain’s handwriting. Instead, the “3” appears identical to one written by Major Bradberry on the line below. You can read more details in the complaint that I filed in federal court in Austin this morning. Billy discovered the forged documents on September 11, 2017, and he immediately reported the forgeries to an investigator with the Upshur County District Attorney’s Office. I am informed that the investigator interviewed at least one of Billy’s superior officers. Upshur County DA Billy Byrd referred the matter to the chief of criminal prosecutions at the Texas Attorney General’s Office in an October 17, 2017 letter. I have not been able to reach Mr. Byrd, but I have spoken with the attorney general’s office and I am awaiting a response. IS DPS THE NEXT TABC? Because of the original Snoop Dogg case, I began blogging about corruption and incompetence in the Texas Alcoholic Beverage Commission last year. I received tips from all over the state, other media started covering the story (particularly the Texas Tribune), legislators held hearings, and eventually most of the top brass at TABC were forced out. A lot of the top personnel at TABC — including former executive director Sherry Cook — were retirees or former employees from DPS, and I strongly suspect that’s where they learned some of their bad habits. 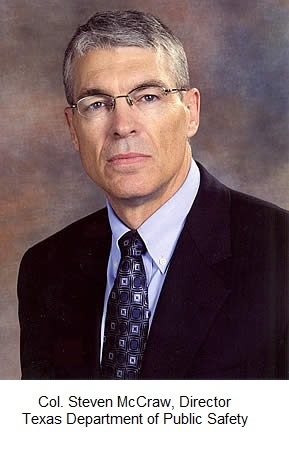 DPS Director Steven McCraw is a lot smarter than Ms. Cook, but he has nonetheless created a top-down culture at DPS where right or wrong is determined by how high you rank. I have received a lot of tips about DPS misconduct since 2015, but I haven’t had time to investigate / report most of the stories. Maybe I need to make time. Last week I received a tip from a DPS employee who said he was suspended after questioning some of the data that was provided to state legislators about a particular agency program. Stay tuned.